I always love a good Burns scene. Anyone post Frogurt or Hammock District yet? This is the greatest Simpson one liner of all time. Here in Albany, it's pretty much a beloved thing, considering how much our area is overlooked by the rest of the country. Seriously, most people outside of here still pronounced it as "AL-BANY". It's "ALL-BANY". Homer building the grill gets me every time, especially at the end when he runs screaming at his failure with lunatic rage in his eyes. That was great. Forgot about that completely... Just classic writing. 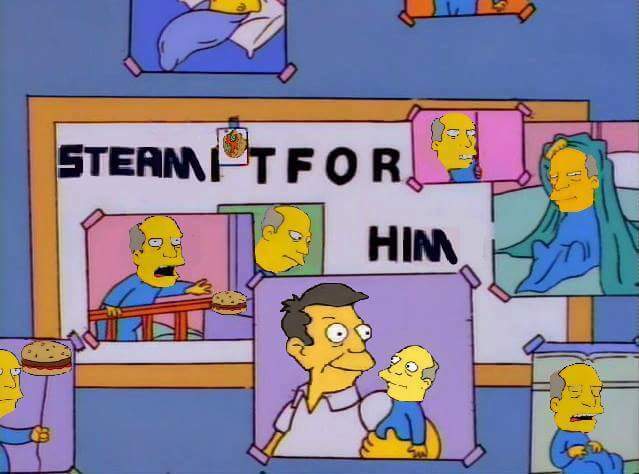 When I was a kid, Steamed Hams was where I first heard of the Aurora Borealis. Likewise I never knew what the Aurora Borealis was either... I always assumed it was like a carnival or something, like Mardis Gras. I've seen the Steamed Hams scene so many times, and I just now noticed that two of the burgers just disappear from the table. Did Skinner eat two Krusty burgers in a single bite? That's probably the most undirectly funny part of the whole joke. "Boking accident" and "It's just a little airborne! It's still good!" come to mind. I always found this to be morbidly hilarious. It's a little joke but it works like a charm! sacrilegious to say in a simpsons thread, but i've always felt like the simpsons is a huge inside joke i was never a part of. i mean, the clip in the op is humorous, but if that's the best of the simpsons, i don't feel like i've really missed much by never getting into it. Oh man, this is an underrated episode. I whistle the clown college music at work on a daily basis and I imagine "kill. Wealthy. Dowager" and "this year buy her English muffins" are top 10 quotes for me. "Would you excuse us Milton"
"Yeah, and your father's no house"
Always makes me laugh. So savage. That never fails to get a laugh out of me. How has this not been posted yet, you disappoint me Era. The way he says "fiddle dee deeeee" just kills me. That and the soft sound made by the nail going through the show just kill me. God this show is indelible. Similarly, I love Apu losing his mind over Skinner's idiotic idea for Billy and the Cloneasaurus. The implication that he's been berating Skinner for like an hour is that extra Simpsons touch that defines what made that show so good. They were so good about layering jokes and compressing each scene into a shining diamond of comedy. Lisa's tiger-repellent rock. The exchange of money at the end is what makes it more than just ordinarily funny. Even if this isn't the loudest you have laughed at the Simpsons, this is still one of the best, if not straight up the best, constructed jokes ever. Man, I had no idea the steamed hams bit was so popular. I’ve always loved the beginning of Homer Goes to College. The two one off characters are amazing. Man, Mr Burns used to be such an incredible character. Is there some language pun in steamed hams? In Spanish is just non sense and I always felt I missed something in that whole gag. I posted a clip earlier in the thread (probably misses his old glasses), but I just remembered one of my all time faves. No pun, but it sounds more believable when skinner says "Hams" is a nickname for burgers, that's one of the things that makes the dubbed version a bit funnier, it's more absurd because he says nonsense. Controversial opinion time: Steamed hams isn't that funny and 22 Short Films About Springfield was one of the least funny episodes up until that point. It was a dull gimmick and a sign of things to come. It's not a controversial opinion when it's right. Nope. Steamed hams was the highlight of the show. It's been a mess ever since. This is the epitome of human ingenuity and development. I don't deserve this kind of shabby treatment! Car hole is one of my favourites. 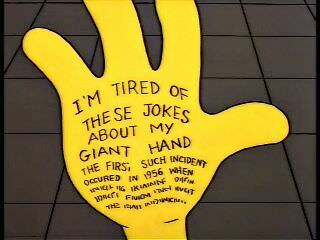 NOTHING makes me laugh harder than Bart's april fools prank on Homer. Came here to post this one. Its brilliant how awful that name is. That episode is so underrated. It's one of my favorites.